OU degree 1st sem revised time table Dec 2016 postponed dates :Osmania University has taken a decision to conduct UG I Year (BA/ B.Com/ B.Sc) 1st semester December 2016 Exams from 14.12.2016.Earlier Ou officials has released tentative time table of degree 1st sem on its Official Webportal www.osmania.ac.in.Now 1st sem exams are postponed which will be conducted from 14th December 2016 .The Candidates who are studying degree 1st year can check and download 1stsemester Osmania University Degree 1st Year Exam Dates 2016 Time Table from Official osmania university Website www.osmania.ac.in. Timings: 2.00 p.m. to 05.00 p.m.
B.Com (CBCS) SEMESTER –I (GEN./COMP./COMP. APPL.,/TAX PRACTICES & PROCEDURES ADVERTISING, SALES PROMOTION & SALES MANAGEMENT & FOREIGN TRADE) B.Com (CBCS) SEMESTER - I EXAMINATIONS, DECEMBER - 2016. B.Com (Hons.,) (CBCS) SEMESTER - I EXAMINATIONS, DECEMBER - 2016. 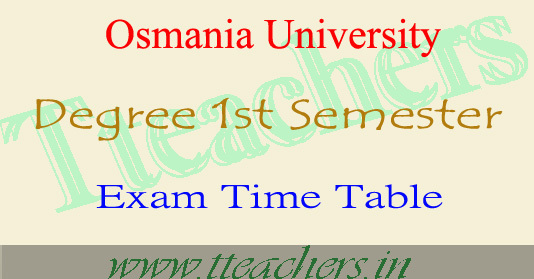 OSMANIA UNIVERSITY; EXAMINATION BRANCH; , HYDERABAD. B.SC (CBCS) SEMESTER- I EXAMINATIONS-DECEMBER 2016. *Telugu, Hindi,,Urdu, Sanskrit,,Arabic,Persian,Marathi,Kannada and French. 1. Any omission or clash in the time-table will be intimated to the C.O.E., O.U, immediately. 2. Candidates whose forms are rejected by the Examination Branch will not be considered. If any Candidate is found not eligible at a later stage his/her registration will be cancelled for this Examination. .
4. Mobile Phones , programmable calculators and other electronic gadgets are strictly not allowed in to the Examination Hall. 5. Fisheries, Forestry and Industrial Chemistry are not existing. If any candidate is opting the same will be intimated to the Controller of Examinations, O.U.